If, in late summer, you notice a cloud of wasps careening in arcs and figure eights across the surface of the grass, don’t be alarmed and don’t reach for the pesticides. Celebrate these native beneficials that consume grub larvae and pollinate flowers! They are scoliid wasps– likely Scolia dubia or a close relative. Although scoliid wasps may look intimidating when they congregate, they will only sting humans if severely harassed. Green June beetle and Japanese beetle grubs, on the other hand, have plenty to fear. A scoliid wasp stings a grub to paralyze it, lays an egg on its surface, and provisions an underground cell with additional paralyzed grubs for its larva to eat as it matures. She then repeats this process, dooming additional grubs as live feed for her offspring in other chambers. 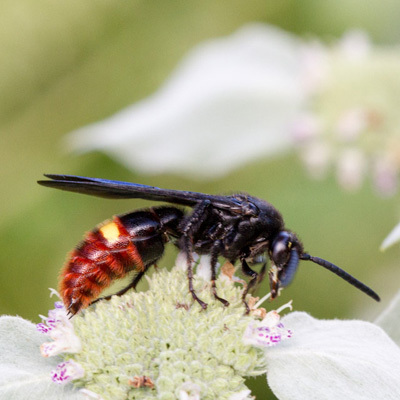 Scoliid wasps’ many common names, including flower wasps, scarab hunters, and scarab hawks, remind us of their multiple functions in our ecosystem and their extraordinary value for gardeners. Thanks Nicole. I rarely see these beautiful wasps except when they’re feeding on flower nectar, especially Mountain Mint’s. There are often so many on the plants’ flowers I’ve often thought we should list their flower color as black and red! I’ve been threatening to do a proper I.D. for far too long, am grateful for your informative posting, and appreciate them all the more now that I know the wasps’ taste for grubs.